It seems that you can never have enough office shelving; with files, CDs, stationery supplies, facilities management goods etc, an office can soon become untidy without an efficient shelving system. 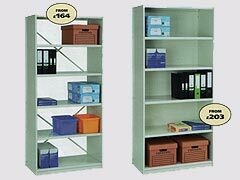 The Capital office shelving range from Greenoaks Ltd is a smart and efficient way to store all your office paraphernalia. Equally at home in the store room or the office, its modular construction allows you to tailor a shelving scheme to fit your space, and to add to it later if your storage needs expand. A number of optional accessories are available with the Capital range to further customise your office shelving scheme. Telescopic and lateral filing cradles make light work of organising suspension files, whilst full height and book dividers easily accommodate ring binders and lever arch files, books, magazines, reports, stationery supplies etc. And since each shelf will support up to 68kg, there is no need to worry about overloading your Capital system. Contact us now and find the right Office Shelving for you! Attractive, hardwearing, simple yet functional, wood appearance Melamine office shelving units offer a storage system to visually match our range of office furniture, including cupboards, desks and cabinets. Available in two stand-alone sizes and one double-sided mobile unit. Storing large numbers of lever arch files can be problematic; the sloping covers of the files means they often fall over and can be difficult to retrieve from the middle of a shelf. Greenoaks Ltd’s lever arch storage system, however, eliminates these problems. Each shelving unit comes complete with file holders, to give each file its own individual compartment and bays to hold 20, 40 or 50 A4 files or 50 Foolscap files are available. A full design and installation service is available to help you make the most efficient use of your available space – and budget! Our designers will ensure that your new office shelving meets all the requirements of your staff and work processes and our on-site team will deliver and install within 10 days. Office Shelving. Call us on 0161 775 7178 or contact us below! If you think office shelving might solve you space problems, call us today on 0161 775 7178 or fill out the form below.